"Sleep cycle" redirects here. For the album by Animal Collective member Deakin, see Sleep Cycle (album). "Circadian" redirects here. For the album by the rock band 5th Projekt, see Circadian (album). A circadian rhythm /sɜːrˈkeɪdiən/ is any biological process that displays an endogenous, entrainable oscillation of about 24 hours. These 24-hour rhythms are driven by a circadian clock, and they have been widely observed in plants, animals, fungi, and cyanobacteria. 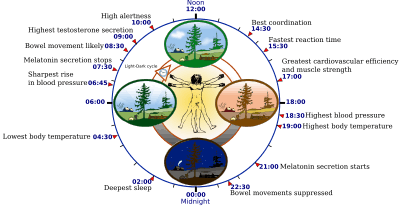 Although circadian rhythms are endogenous ("built-in", self-sustained), they are adjusted (entrained) to the local environment by external cues called zeitgebers (from German, "time giver"), which include light, temperature and redox cycles. 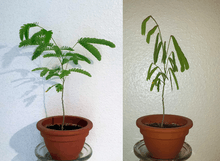 The earliest recorded account of a circadian process dates from the 4th century B.C.E., when Androsthenes, a ship captain serving under Alexander the Great, described diurnal leaf movements of the tamarind tree. The observation of a circadian or diurnal process in humans is mentioned in Chinese medical texts dated to around the 13th century, including the Noon and Midnight Manual and the Mnemonic Rhyme to Aid in the Selection of Acu-points According to the Diurnal Cycle, the Day of the Month and the Season of the Year. In 1896, Patrick and Gilbert observed that during a prolonged period of sleep deprivation, sleepiness increases and decreases with a period of approximately 24 hours. In 1918, J.S. Szymanski showed that animals are capable of maintaining 24-hour activity patterns in the absence of external cues such as light and changes in temperature. In the early 20th century, circadian rhythms were noticed in the rhythmic feeding times of bees. Extensive experiments were done by Auguste Forel, Ingeborg Beling, and Oskar Wahl to see whether this rhythm was due to an endogenous clock. Ron Konopka and Seymour Benzer isolated the first clock mutant in Drosophila in the early 1970s and mapped the "period" gene, the first discovered genetic determinant of behavioral rhythmicity. Joseph Takahashi discovered the first mammalian circadian clock mutation (clockΔ19) using mice in 1994. However, recent studies show that deletion of clock does not lead to a behavioral phenotype (the animals still have normal circadian rhythms), which questions its importance in rhythm generation. The term circadian was coined by Franz Halberg in the 1950s. Circadian rhythms allow organisms to anticipate and prepare for precise and regular environmental changes. They thus enable organisms to best capitalize on environmental resources (e.g. light and food) compared to those that cannot predict such availability. It has therefore been suggested that circadian rhythms put organisms at a selective advantage in evolutionary terms. However, rhythmicity appears to be as important in regulating and coordinating internal metabolic processes, as in coordinating with the environment. This is suggested by the maintenance (heritability) of circadian rhythms in fruit flies after several hundred generations in constant laboratory conditions, as well as in creatures in constant darkness in the wild, and by the experimental elimination of behavioral, but not physiological, circadian rhythms in quail. What drove circadian rhythms to evolve has been an enigmatic question. Previous hypotheses emphasized that photosensitive proteins and circadian rhythms may have originated together in the earliest cells, with the purpose of protecting replicating DNA from high levels of damaging ultraviolet radiation during the daytime. As a result, replication was relegated to the dark. However, evidence for this is lacking, since the simplest organisms with a circadian rhythm, the cyanobacteria, do the opposite of this - they divide more in the daytime. Recent studies instead highlight the importance of co-evolution of redox proteins with circadian oscillators in all three kingdoms of life following the Great Oxidation Event approximately 2.3 billion years ago. The current view is that circadian changes in environmental oxygen levels and the production of reactive oxygen species (ROS) in the presence of daylight are likely to have driven a need to evolve circadian rhythms to preempt, and therefore counteract, damaging redox reactions on a daily basis. The simplest known circadian clock is that of the prokaryotic cyanobacteria. Recent research has demonstrated that the circadian clock of Synechococcus elongatus can be reconstituted in vitro with just the three proteins (KaiA, KaiB, KaiC) of their central oscillator. This clock has been shown to sustain a 22-hour rhythm over several days upon the addition of ATP. Previous explanations of the prokaryotic circadian timekeeper were dependent upon a DNA transcription/translation feedback mechanism. It is now known that the molecular circadian clock can function within a single cell; i.e., it is cell-autonomous. This was shown by Gene Block in isolated mollusk BRNs. At the same time, different cells may communicate with each other resulting in a synchronised output of electrical signaling. These may interface with endocrine glands of the brain to result in periodic release of hormones. The receptors for these hormones may be located far across the body and synchronise the peripheral clocks of various organs. Thus, the information of the time of the day as relayed by the eyes travels to the clock in the brain, and, through that, clocks in the rest of the body may be synchronised. This is how the timing of, for example, sleep/wake, body temperature, thirst, and appetite are coordinately controlled by the biological clock. Circadian rhythmicity is present in the sleeping and feeding patterns of animals, including human beings. There are also clear patterns of core body temperature, brain wave activity, hormone production, cell regeneration, and other biological activities. In addition, photoperiodism, the physiological reaction of organisms to the length of day or night, is vital to both plants and animals, and the circadian system plays a role in the measurement and interpretation of day length. Timely prediction of seasonal periods of weather conditions, food availability, or predator activity is crucial for survival of many species. Although not the only parameter, the changing length of the photoperiod ('daylength') is the most predictive environmental cue for the seasonal timing of physiology and behavior, most notably for timing of migration, hibernation, and reproduction. The rhythm is linked to the light–dark cycle. Animals, including humans, kept in total darkness for extended periods eventually function with a free-running rhythm. Their sleep cycle is pushed back or forward each "day", depending on whether their "day", their endogenous period, is shorter or longer than 24 hours. The environmental cues that reset the rhythms each day are called zeitgebers (from the German, "time-givers"). Totally blind subterranean mammals, e.g., blind mole rat Spalax sp., are able to maintain their endogenous clocks in the apparent absence of external stimuli. Although they lack image-forming eyes, their photoreceptors (which detect light) are still functional; they do surface periodically as well. Illustration of the morning (yellow) and evening (gray) circadian clock loops in Arabidopsis, entrainable through light. Transcriptional regulation is shown through black lines and protein complexes are denoted by dashed black lines. Post-translational regulation is shown by dashed red lines. Light sensitive elements are denoted with lightning bolts and yellow circles. Early research into circadian rhythms suggested that most people preferred a day closer to 25 hours when isolated from external stimuli like daylight and timekeeping. However, this research was faulty because it failed to shield the participants from artificial light. Although subjects were shielded from time cues (like clocks) and daylight, the researchers were not aware of the phase-delaying effects of indoor electric lights. The subjects were allowed to turn on light when they were awake and to turn it off when they wanted to sleep. Electric light in the evening delayed their circadian phase. A more stringent study conducted in 1999 by Harvard University estimated the natural human rhythm to be closer to 24 hours, 11 minutes: much closer to the solar day but still not perfectly in sync. Other physiological changes that occur according to a circadian rhythm include heart rate and many cellular processes "including oxidative stress, cell metabolism, immune and inflammatory responses, epigenetic modification, hypoxia/hyperoxia response pathways, endoplasmic reticular stress, autophagy, and regulation of the stem cell environment. In a study of young men, it was found that the heart rate reaches its lowest average rate during sleep, and its highest average rate shortly after waking. More-or-less independent circadian rhythms are found in many organs and cells in the body outside the suprachiasmatic nuclei (SCN), the "master clock". These clocks, called peripheral oscillators, are found in the adrenal gland, oesophagus, lungs, liver, pancreas, spleen, thymus, and skin. Though oscillators in the skin respond to light, a systemic influence has not been proven. There is also some evidence that the olfactory bulb and prostate may experience oscillations when cultured, suggesting that these structures may also be weak oscillators. Furthermore, liver cells, for example, appear to respond to feeding rather than to light. Cells from many parts of the body appear to have free-running rhythms. Timing of medical treatment in coordination with the body clock may significantly increase efficacy and reduce drug toxicity or adverse reactions. Health problems can result from a disturbance to the circadian rhythm. Circadian rhythms also play a part in the reticular activating system, which is crucial for maintaining a state of consciousness. A reversal in the sleep–wake cycle may be a sign or complication of uremia, azotemia or acute renal failure. Obesity and diabetes are associated with lifestyle and genetic factors. Among those factors, disruption of the circadian clockwork and/or misalignment of the circadian timing system with the external environment (e.g., light-dark cycle) might play a role in the development of metabolic disorders. Shift-work or chronic jet-lag have profound consequences on circadian and metabolic events in the body. Animals that are forced to eat during their resting period show increased body mass and altered expression of clock and metabolic genes. In humans, shift-work that favors irregular eating times is associated with altered insulin sensitivity and higher body mass. Shift-work also leads to increased metabolic risks for cardio-metabolic syndrome, hypertension, inflammation. Due to the work nature of airline pilots, who often cross several timezones and regions of sunlight and darkness in one day, and spend many hours awake both day and night, they are often unable to maintain sleep patterns that correspond to the natural human circadian rhythm; this situation can easily lead to fatigue. The NTSB cites this as contributing to many accidents  and has conducted several research studies in order to find methods of combating fatigue in pilots. Disruption to rhythms usually has a negative effect. Many travellers have experienced the condition known as jet lag, with its associated symptoms of fatigue, disorientation, and insomnia. A number of other disorders, for example bipolar disorder and some sleep disorders such as delayed sleep phase disorder (DSPD), are associated with irregular or pathological functioning of circadian rhythms. Disruption to rhythms in the longer term is believed to have significant adverse health consequences on peripheral organs outside the brain, in particular in the development or exacerbation of cardiovascular disease. Blue LED lighting suppresses melatonin production five times more than the orange-yellow high-pressure sodium (HPS) light; a metal halide lamp, which is white light, suppresses melatonin at a rate more than three times greater than HPS. Depression symptoms from long term nighttime light exposure can be undone by returning to a normal cycle. 1 2 Edgar, Rachel S.; Green, Edward W.; Zhao, Yuwei; van Ooijen, Gerben; Olmedo, Maria; Qin, Ximing; Xu, Yao; Pan, Min; Valekunja, Utham K. (24 May 2012). "Peroxiredoxins are conserved markers of circadian rhythms". Nature. 485 (7399): 459–464. Bibcode:2012Natur.485..459E. doi:10.1038/nature11088. ISSN 0028-0836. PMC 3398137 . PMID 22622569. ↑ Vitaterna, MS; Takahashi, JS; Turek, FW (2001). "Overview of circadian rhythms". Alcohol Research and Health. 25 (2): 85–93. PMID 11584554. 1 2 Bass, Joseph (15 November 2012). "Circadian topology of metabolism". Nature. 491 (7424): 348–356. Bibcode:2012Natur.491..348B. doi:10.1038/nature11704. ISSN 0028-0836. ↑ Bretzl H (1903). Botanische Forschungen des Alexanderzuges. Leipzig: Teubner. ↑ Gwei-Djen Lu (25 October 2002). Celestial Lancets. Psychology Press. pp. 137–140. ISBN 978-0-7007-1458-2. ↑ de Mairan JJO (1729). "Observation Botanique". Histoire de l'Academie Royale des Sciences: 35–36. ↑ Dijk DJ, von Schantz M; von Schantz (August 2005). "Timing and consolidation of human sleep, wakefulness, and performance by a symphony of oscillators". J. Biol. Rhythms. 20 (4): 279–90. doi:10.1177/0748730405278292. PMID 16077148. ↑ Danchin A. "Important dates 1900–1919". HKU-Pasteur Research Centre. Paris. Retrieved 2008-01-12. ↑ Konopka RJ, Benzer S; Benzer (September 1971). "Clock mutants of Drosophila melanogaster". Proc. Natl. Acad. Sci. U.S.A. 68 (9): 2112–6. Bibcode:1971PNAS...68.2112K. doi:10.1073/pnas.68.9.2112. PMC 389363 . PMID 5002428. ↑ "Gene Discovered in Mice that Regulates Biological Clock". Chicago Tribune. 29 April 1994. ↑ Vitaterna MH, King DP, Chang AM, et al. (April 1994). "Mutagenesis and mapping of a mouse gene, Clock, essential for circadian behavior". Science. 264 (5159): 719–25. doi:10.1126/science.8171325. PMID 8171325. ↑ DeBruyne (2006). "A Clock Shock: Mouse CLOCK Is Not Required for Circadian Oscillator Function". Neuron. 50: 465–77. doi:10.1016/j.neuron.2006.03.041. PMID 16675400. ↑ Collins, Ben (2006). "Keeping time without a clock". Neuron. 50: 348–50. doi:10.1016/j.neuron.2006.04.022. PMID 16675389. ↑ Johnson, Carl (2004). Chronobiology: Biological Timekeeping. Sunderland, Massachusetts, USA: Sinauer Associates, Inc. pp. 67–105. ↑ Sharma VK (November 2003). "Adaptive significance of circadian clocks". Chronobiology International. 20 (6): 901–19. doi:10.1081/CBI-120026099. PMID 14680135. ↑ Mori, Tetsuya; Johnson, Carl Hirschie (2001-04-15). "Independence of Circadian Timing from Cell Division in Cyanobacteria". Journal of Bacteriology. 183 (8): 2439–2444. doi:10.1128/JB.183.8.2439-2444.2001. ISSN 0021-9193. PMID 11274102. ↑ Hut RA, Beersma DG; Beersma (July 2011). "Evolution of time-keeping mechanisms: early emergence and adaptation to photoperiod". Philos. Trans. R. Soc. Lond., B, Biol. Sci. 366 (1574): 2141–54. doi:10.1098/rstb.2010.0409. PMC 3130368 . PMID 21690131. ↑ Zivkovic, Bora "Coturnix" (2007-07-25). "Clock Tutorial #16: Photoperiodism – Models and Experimental Approaches (original work from 2005-08-13)". A Blog Around the Clock. ScienceBlogs. Retrieved 2007-12-09. ↑ Turek FW, Joshu C, Kohsaka A, et al. (May 2005). "Obesity and metabolic syndrome in circadian Clock mutant mice". Science. 308 (5724): 1043–5. Bibcode:2005Sci...308.1043T. doi:10.1126/science.1108750. PMC 3764501 . PMID 15845877. ↑ Delezie J, Dumont S, Dardente H, et al. (August 2012). "The nuclear receptor REV-ERBα is required for the daily balance of carbohydrate and lipid metabolism". FASEB J. 26 (8): 3321–35. doi:10.1096/fj.12-208751. PMID 22562834. ↑ Shneerson, J.M. ; Ohayon, M.M. ; Carskadon, M.A. (2007). "Circadian rhythms". Rapid eye movement (REM) sleep. Armenian Medical Network. Retrieved 2007-09-19. ↑ Regestein QR, Pavlova M; Pavlova (September 1995). "Treatment of delayed sleep phase syndrome". Gen Hosp Psychiatry. 17 (5): 335–45. doi:10.1016/0163-8343(95)00062-V. PMID 8522148. ↑ Elizabeth Howell (14 December 2012). "Space Station to Get New Insomnia-Fighting Light Bulbs". Retrieved 2012-12-17. ↑ Spilde, Ingrid (December 2005). "Reinsdyr uten døgnrytme" (in Norwegian Bokmål). forskning.no. Retrieved 2007-11-24. ...så det ikke ut til at reinen hadde noen døgnrytme om sommeren. Svalbardreinen hadde det heller ikke om vinteren. ↑ Folk, G. Edgar; Thrift, Diana L.; Zimmerman, M. Bridget; Reimann, Paul (2006-12-01). "Mammalian activity – rest rhythms in Arctic continuous daylight". Biological Rhythm Research. 37 (6): 455–469. doi:10.1080/09291010600738551. Retrieved 2014-09-21. Would local animals maintained under natural continuous daylight demonstrate the Aschoff effect described in previously published laboratory experiments using continuous light, in which rats' circadian activity patterns changed systematically to a longer period, expressing a 26-hour day of activity and rest? ↑ Kyriacou CP (September 2009). "Physiology. Unraveling traveling". Science. 325 (5948): 1629–30. doi:10.1126/science.1178935. PMID 19779177. 1 2 Webb AAR (June 2003). "The physiology of circadian rhythms in plants". New Phytologist. 160 (160): 281–303. doi:10.1046/j.1469-8137.2003.00895.x. JSTOR 1514280. 1 2 3 McClung CR (April 2006). "Plant circadian rhythms". Plant Cell. 18 (4): 792–803. doi:10.1105/tpc.106.040980. PMC 1425852 . PMID 16595397. ↑ Mizoguchi T, Wright L, Fujiwara S, et al. (August 2005). "Distinct roles of GIGANTEA in promoting flowering and regulating circadian rhythms in Arabidopsis". Plant Cell. 17 (8): 2255–70. doi:10.1105/tpc.105.033464. PMC 1182487 . PMID 16006578. ↑ Kolmos E, Davis SJ; Davis (September 2007). "ELF4 as a Central Gene in the Circadian Clock". Plant Signal Behav. 2 (5): 370–2. doi:10.4161/psb.2.5.4463. PMC 2634215 . PMID 19704602. ↑ "Biological Clock in Mammals". BioInteractive. Howard Hughes Medical Institute. Retrieved 5 May 2015. ↑ Welsh, David K.; Takahashi, Joseph S.; Kay, Steve A. (March 2010). "Suprachiasmatic Nucleus: Cell Autonomy and Network Properties". Annu Rev Physiol. 72: 551–577. doi:10.1146/annurev-physiol-021909-135919. PMC 3758475 . PMID 20148688. ↑ Kalpesh, J. "Wellness With Artificial Light". Retrieved 11 January 2016. ↑ Duffy JF, Wright KP; Wright Jr (August 2005). "Entrainment of the human circadian system by light". J. Biol. Rhythms. 20 (4): 326–38. doi:10.1177/0748730405277983. PMID 16077152. ↑ Cromie, William (1999-07-15). "Human Biological Clock Set Back an Hour". Harvard Gazette. Retrieved 2015-07-04. 1 2 3 Benloucif, S.; Guico, M. J.; Reid, K. J.; Wolfe, L. F.; l'Hermite-Balériaux, M; Zee, P. C. (2005). "Stability of Melatonin and Temperature as Circadian Phase Markers and Their Relation to Sleep Times in Humans". Journal of Biological Rhythms. 20 (2): 178–188. doi:10.1177/0748730404273983. ISSN 0748-7304. PMID 15834114. ↑ Baehr, E.K. ; Revelle, W.; Eastman, C.I. (June 2000). "Individual differences in the phase and amplitude of the human circadian temperature rhythm: with an emphasis on morningness-eveningness". J Sleep Res. 9 (2): 117–27. doi:10.1046/j.1365-2869.2000.00196.x. PMID 10849238. ↑ "NHLBI Workshop: "Circadian Clock at the Interface of Lung Health and Disease" 28-29 April 2014 Executive Summary". National Heart, Lung, and Blood Institute. September 2014. Retrieved 20 September 2014. ↑ Cauter, Eve Van (1991). "Quantitative Analysis of the 24-Hour Blood Pressure and Heart Rate Patterns in Young Men". Hypertension. 18: 199–210. ↑ Quartel, Lara (2014). "The effect of the circadian rhythm of body temperature on A-level exam performance". Undergraduate Journal of Psychology. 27 (1). ↑ Kawara S, Mydlarski R, Mamelak AJ, et al. (December 2002). "Low-dose ultraviolet B rays alter the mRNA expression of the circadian clock genes in cultured human keratinocytes". J. Invest. Dermatol. 119 (6): 1220–3. doi:10.1046/j.1523-1747.2002.19619.x. PMID 12485420. ↑ Czeisler, Charles A (1999). "Stability, precision, and near-24-hour period of the human circadian pacemaker". Science. 284. doi:10.1126/science.284.5423.2177. ↑ Aldrich, Michael S. (1999). Sleep medicine. New York: Oxford University Press. ISBN 0-19-512957-1. ↑ Wyatt, James K. "Circadian temperature and melatonin rhythms, sleep, and neurobehavioral function in humans living on a 20-h day". American Journal of Physiology. 277 (4): R1152-R1163. ↑ Wright, Jr., Kenneth P. "Relationship between alertness, performance, and body temperature in humans". American Journal of Physiology. 283. doi:10.1152/ajpregu.00205.2002. ↑ Zhou, Xuan (2011). "Sleep, wake and phase dependent changes in neurobehavioral function under forced desynchrony". Sleep. 34: 931–941. ↑ Kosmadopoulos, Anastasi. "The effects of a split sleep-wake schedule on neurobehavioral performance and predictions of performance under conditions of forced desynchrony". Chronobiology International. 31: 1209–1217. doi:10.3109/07420528.2014.957763. ↑ Grote L, Mayer J, Penzel T, et al. (1994). "Nocturnal hypertension and cardiovascular risk: consequences for diagnosis and treatment". J. Cardiovasc. Pharmacol. 24 Suppl 2: S26–38. PMID 7898092. 1 2 3 Zelinski, EL (2014). "The trouble with circadian clock dysfunction: Multiple deleterious effects on the brain and body.". Neuroscience and Biobehavioral Reviews. 40 (40): 80–101. doi:10.1016/j.neubiorev.2014.01.007. PMID 24468109. ↑ Sinert T, Peacock PR (10 May 2006). "Renal Failure, Acute". eMedicine from WebMD. Retrieved 2008-08-03. ↑ Figueiro MG, Rea MS, Bullough JD (2006). "Does architectural lighting contribute to breast cancer?". J Carcinog. 5: 20. doi:10.1186/1477-3163-5-20. PMC 1557490 . PMID 16901343. ↑ Rea, Mark S.; Figueiro, Mariana; Bullough, John (May 2002). "Circadian photobiology: an emerging framework for lighting practice and research". Lighting Research Technology. 34 (3): 177–187. doi:10.1191/1365782802lt057oa. ↑ Walmsley, Lauren; Hanna, Lydia; Mouland, Josh; Martial, Franck; West, Alexander; Smedley, Andrew R; Bechtold, David A; Webb, Ann R; Lucas, Robert J; Brown, Timothy M (17 April 2015). "Colour As a Signal for Entraining the Mammalian Circadian Clock". PLOS Biology. 13 (4). doi:10.1371/journal.pbio.1002127. Retrieved 19 May 2016. ↑ Delezie J, Challet E (December 2011). "Interactions between metabolism and circadian clocks: reciprocal disturbances". Ann. N. Y. Acad. Sci. 1243: 30–46. Bibcode:2011NYASA1243...30D. doi:10.1111/j.1749-6632.2011.06246.x. PMID 22211891. ↑ Oritz-Tuldela E, Martinez-Nicolas A, Diaz-Mardomingo C, Garcia-Herranz S, Pereda-Perez I, Valencia A, Peraita H, Venero C, Madrid J, Rol M. 2014. The Characterization of Biological Rhythms in Mild Cognitive Impairment. BioMed Research International. ↑ Robert Hardt. "The Dangers of LED-Blue light-The Suppression of Melatonin-Resulting in-Insomnia-And Cancers". 1 2 3 "EBSCO Publishing Service Selection Page". Avivi, A.; Albrecht, U.; Oster, H.; Joel, A.; Beiles, A.; Nevo, E. (November 2001). "Biological clock in total darkness: the Clock/MOP3 circadian system of the blind subterranean mole rat". Proceedings of the National Academy of Sciences of the United States of America. 98 (24): 13751–6. Bibcode:2001PNAS...9813751A. doi:10.1073/pnas.181484498. PMC 61113 . PMID 11707566. Avivi, A.; Oster, H.; Joel, A.; Beiles, A.; Albrecht, U.; Nevo, E. (September 2002). "Circadian genes in a blind subterranean mammal II: conservation and uniqueness of the three Period homologs in the blind subterranean mole rat, Spalax ehrenbergi superspecies". Proceedings of the National Academy of Sciences of the United States of America. 99 (18): 11718–23. Bibcode:2002PNAS...9911718A. doi:10.1073/pnas.182423299. PMC 129335 . PMID 12193657. Li D, Ma S, Guo D, et al. (February 2016). "Environmental circadian disruption worsens neurologic impairment and inhibits hippocampal neurogenesis in adult rats after traumatic brain injury". Cell Mol Neurobiol. doi:10.1007/s10571-015-0295-2. PMID 26886755. Ditty, J.L. ; Williams, S.B. ; Golden, S.S. (2003). "A cyanobacterial circadian timing mechanism". Annual Review of Genetics. 37: 513–43. doi:10.1146/annurev.genet.37.110801.142716. PMID 14616072. Dvornyk, V.; Vinogradova, O.; Nevo, E. (March 2003). "Origin and evolution of circadian clock genes in prokaryotes". Proceedings of the National Academy of Sciences of the United States of America. 100 (5): 2495–500. Bibcode:2003PNAS..100.2495D. doi:10.1073/pnas.0130099100. PMC 151369 . PMID 12604787. Takahashi, J.S. ; Zatz, M. (September 1982). "Regulation of circadian rhythmicity". Science. 217 (4565): 1104–11. Bibcode:1982Sci...217.1104T. doi:10.1126/science.6287576. PMID 6287576. Tomita, J.; Nakajima, M.; Kondo, T.; Iwasaki, H. (January 2005). "No transcription-translation feedback in circadian rhythm of KaiC phosphorylation". Science. 307 (5707): 251–4. Bibcode:2005Sci...307..251T. doi:10.1126/science.1102540. PMID 15550625.